The first step of the process was building the deck. I chose to take this step on 100% by myself! I did a lot of research and felt pretty confident in my ability to complete it! The hardest part was leveling the ground and ensuring that my base blocks were square. From there, creating the frame and braces and installing the deck board and plywood was extremely easy! End of Day 1 with my little helper! The second weekend was definitely the one I was most worried about as I've never framed a house before! My dad and stepmom came in to assist with this step! I was confident in their abilities because they had previously built an awesome storage barn in their own backyard! We worked tirelessly all weekend and managed to get the entire playhouse framed, all of the siding and trim installed, the roof put on, and all of the doors built! 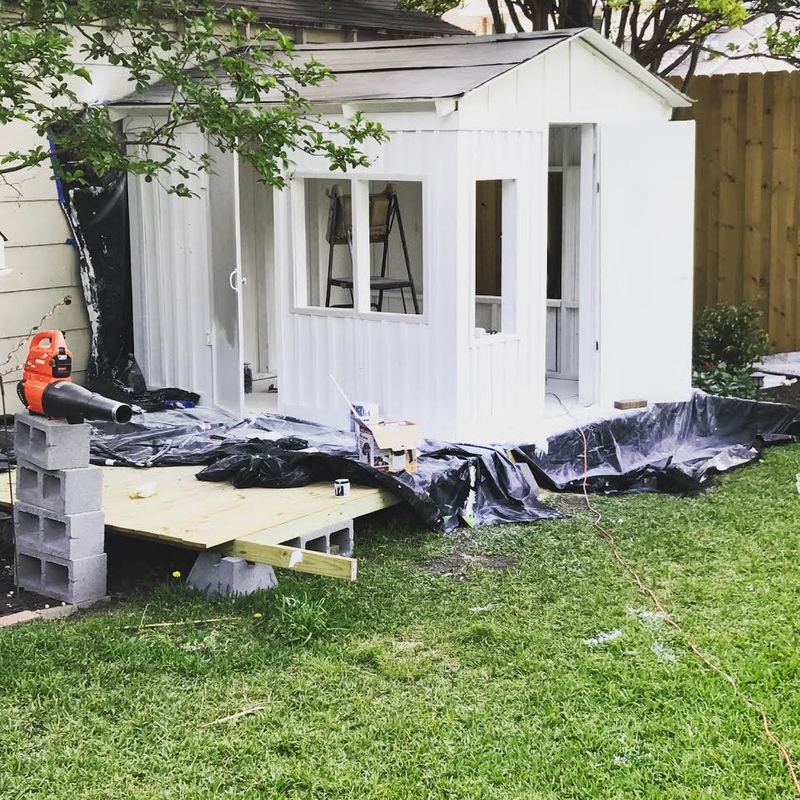 I had planned on getting the shingles installed and the playhouse painted, but I quickly realized there was no way that was all going to get done in one weekend. The following weekend I painted the entire home, cut out holes in the doors for the windows, and installed all of the screen! The painting went pretty well. I originally started out with a brush and roller but decided that if I continued that way it was going to take forever! I decided to buy an inexpensive paint sprayer. It took 3 trips to Home Depot, and 5 gallons of paint, but I finally got both the exterior and interior painted white! I used the small tester pots to paint the doors and trim a light greige. I also went back and painted all of the door hardware a hammered gold! I am obsessed with the color scheme!! It is so feminine yet chic. I secretly want to repaint our house to match hers now!! This weekend, the final weekend, my mom and step dad came into town. My step dad installed the shingles while I completed the deck edges so that you wouldn't be able to see the cinder block supports! Completed deck and shingles in place!! Completed structure!!! Ready to decorate! I can't believe that the structure is done!! The fun is only beginning!! Now I get to add all of the exterior decorative features and begin designing the interior!! I am beside myself!! This has been such a fun project and such a cool test of my design and construction skills! I tried things I've never done before, and am so proud of what we created!!! I can't wait for Stella to spend years growing up and spending time in this perfect little house we created for her!! I'm considering doing an in depth post for each step of the build. Would anyone be interested in that? If so, please let me know!! !